Over the years we’ve shared a lot of sensory play ideas for kids and there’s one thing that’s always super popular with my kids – playdough. Our calming lavender playdough is one of the most popular posts we’ve ever shared (and my kids loved it) so today I thought I’d share this zesty lemon playdough recipe, perfect for the summer or whenever you need a bit of a citrus-y pickup! Unlike the recipe we used for the lavender playdough this is a playdough recipe with no cream of tartar. Why? Easy – I ran out. There are lots of different ways to make playdough – cooking it, no cook playdough recipes, making playdough with cream of tartar or without it but they’ve all come out fairly similar to me. The only one I’ve seen with a really different consistency is the one my daughters nursery make so I’m trying to get that playdough recipe off them before they break up for summer – I’ll share it here if I manage it! 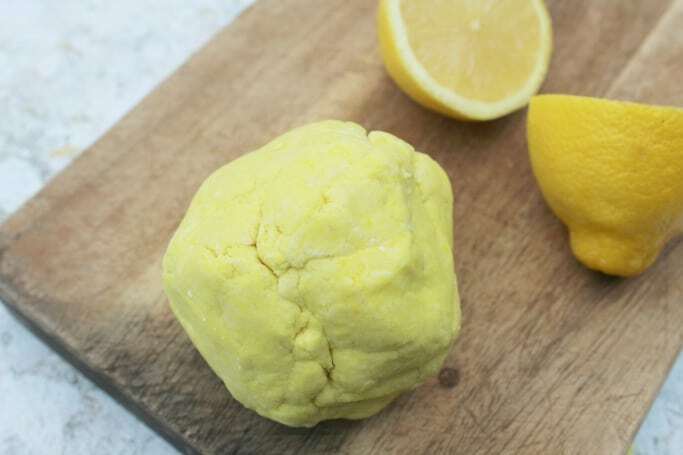 This lemon playdough is really easy to make and thankfully you’re likely to have all or most of the ingredients already which mean that it’s a great fall back activity if your kids claim that they’re bored. (And hey, in that case I recommend that you save or pin this so you can grab the recipe when you need it! 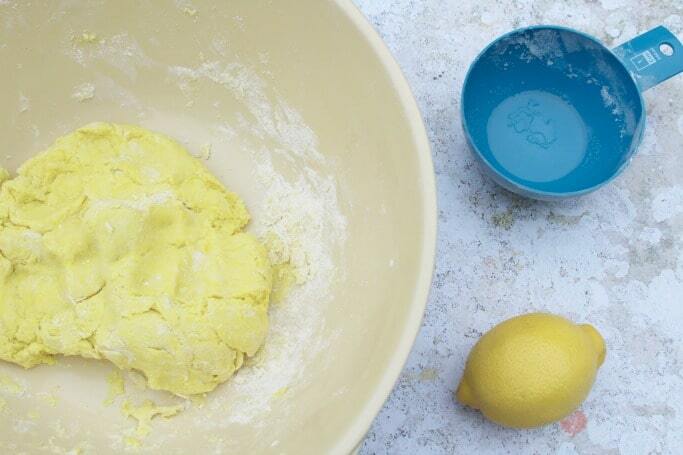 This lemon playdough recipe makes enough for two or three kids to play with, if you want to make more or less just scale the recipe accordingly. 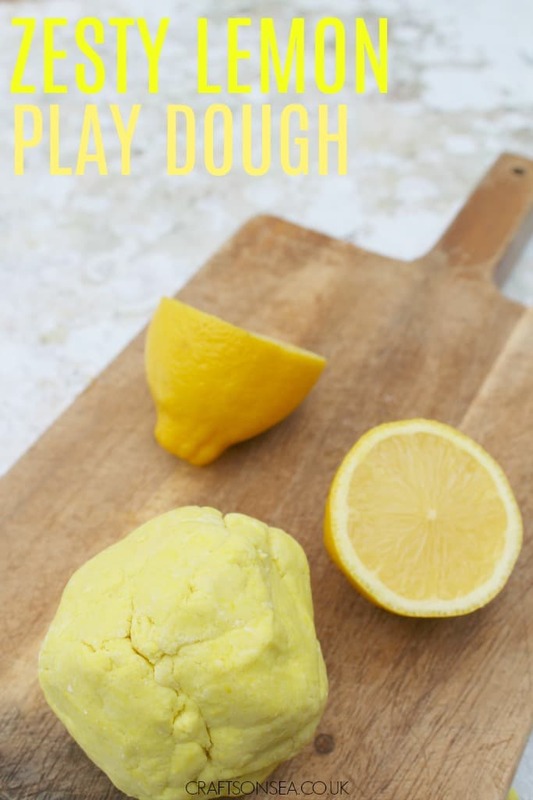 Making lemon scented playdough is super easy, essentially you are just going to put all of your ingredients into your bowl and give it a good mix and knead until it reaches a consistency that you are happy with. To dry? Add some water or a bit more lemon juice. Too wet? Pop in a bit more flour. We’ve made a lot of playdough over the years and we always end up adding or changing a bit of something so don’t panic if you accidentally add a bit too much of something – it can be fixed! Both fresh lemon juice or bottled are fine for this lemon playdough recipe so just use whatever you have to hand. I use liquid food dye because I once dyed my hands bright red using the gel but again use whatever suits you best! As well as the ones I’ve already mentioned you might like these frozen flowers which are great for summer sensory play, this chocolate scented playdough or maybe try out making some foam with your kids!